Teacher talk in a foreign language – Use with caution! Several years ago, a Spanish colleague who was teaching International Law to Spanish-speaking students in a university in Madrid, challenged my belief that instruction in EMI requires adapting one’s own teaching methodology. “What do you mean I should scaffold the readings?” she asked. “I set the relevant texts, and it’s their students’ problem, not mine, to make sense of them.” Que se busquen la vida was the Spanish way of putting it. In short, she saw the challenging of overcoming the language barrier as the students’ responsibility, exclusively, and found no need to teach her EMI course differently from how she would teach it in Spanish, both her and her students’ monther-tongue. This short text provides a number of counter-arguments to this view, which I find is quite commonplace in EMI lecturers. It is based on my own experience teaching EMI courses and coordinating a team of EMI teachers. It is also supported by research in the field, by authors such as Emma Dafouz and David Lasagabaster. 1.- Teacher talk is less effective in English than in L1. Several studies have questioned EMI lecturers about the main obstacles of EMI, and many have identified the difficulty of interacting “naturally” and “spontaneously” with students. Tellingly, one of these lecturers claimed that “for me, the biggest difference when teaching in English is that I find it hard to be spontaneous and (I believe) fun […] I can’t joke with the students, which for me is a way to keep them engaged.” (Dafouz, Núñez, Sancho y Foran 2007; cited in Dafouz 2015). Understandably, teaching styles that follow the “sage on the stage” paradigm will suffer more by switching to a foreign language. 2.- Teacher input is limited from language standpoint, and must be supplemented with materials produced by native speakers. This is not merely a linguistic point, as it overlaps with the need for students to speak and write fluently and correctly about the subject content. This requires, for instance, effective use of academic vocabulary, lexical collocations…which are hard to master for non-native speakers. The specific use of academic verbs such as “discuss”, “argue”, “implement”, “assess”, etc. Teachers often share with students their own notes and Powerpoint presentations. This may come as an adequate support of content acquisition, but I believe that, for students to obtain the full benefits of EMI instruction, the course design should also provide ample opportunities for engaging with authentic and non-authentic texts (written and aural) produced by native speakers of English. These texts can range from less to more technical, including newspaper articles and video reports, documentaries, news stories, textbook chapters, journal articles, lab reports…In turn, work on these texts should promote a more learner-centered instruction that will offer opportunities for discussion, problem-solving and so on. 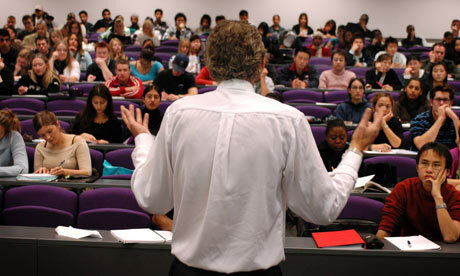 In my experience as an EMI lecturer, it is worth it to offer students the chance of reading, say, academic essays and scientific reports published in English, as their genre requirements and conventions differ from the Spanish ones, and acquaintance with such genres are “a part of” learning those academic contents in L2. More so if we expect students to be able to speak or write in those genres as part of their coursework. For instance, if we want students to write a Biology or Chemistry lab report in English, it makes sense that will have read, discussed and analyzed samples of lab reports published in English-speaking contexts, and not merely “translate” a lab report the way they would be done in the L1 contexts. The same is true of other academic / disciplinar genres such as debates, presentations or academic essays. For all these reasons, as Dafouz (2015) argues, EMI lecturers would gain from promoting a more learner-centered teaching methodology, enhancing the role of the teacher as mediator of information. And offer a number of explicit scaffolds to support learners in mastering the course contents in a language neither them nor the teacher is fully proficient in. In another article I will be discussing what some of these scaffolds can be.